Poster, London & North Eastern Railway, Fountains Abbey, by Fred Taylor, 1927. Coloured lithograph depicting the ruins of the abbey church, with an ecclesiastical procession. At left are figures in medieval dress. Text beneath gives the title and advises that information is available from LNER offices, and Ripon is the nearest station. Format quad royal. Printed by John Waddington Ltd. Lithographers, Leeds & London. Playing cards, London & North Eastern Railway, Waddington's 'Beautiful Britain' series, York (Stonegate). Overall: 92 mm x 61 mm x 17 mm. Playing cards, London & North Eastern Railway, incomplete, with view of the Trossachs on back of each card, pasteboard, English, 1927-1940. 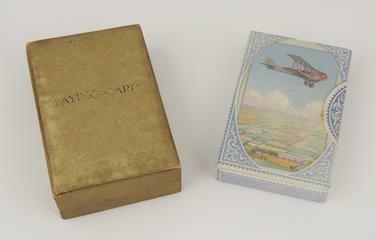 Pack of playing cards, boxed, London & North Eastern Railway, `Beautiful Britain' series, `Whitby' variant, 1925-1940. Pack of playing cards, London & North Eastern Railway, by John Waddington Ltd., Leeds & London depicting York Minster on reverse. Playing cards, London & North Eastern Railway, 2 packs, Waddington's 'Beautiful Britain' series, incomplete, York and Houses of Parliament. Pack of playing cards, London & North Eastern Railway, "Beautiful Britain" series, Bamburgh Castle, monochrome, 1930-1940. 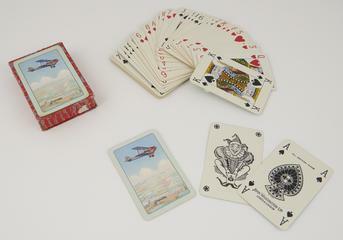 Playing cards, London & North Eastern Railway, depicting Royal Deeside, by John Waddington, Leeds & London. Pack of playing cards, London & North Eastern Railway, `Beautiful Britain' series, `technicolour' variant, Clacton type, 1925-1940. Pack of playing cards, London & North Eastern Railway, Waddington's "Beautiful Britain" cards, depicting Richmond, Yorkshire. Poster, London & North Eastern Railway, 'St Andrews' by Fred Taylor, 1941, printed by John Waddington Ltd., Leeds & London. With the text: 'The home of the royal and ancient game'. Coloured lithograph of St Andrews castle, the cliffs and beach. The game referred to in the title is golf. Part of the 'It's Quicker by Rail' series. Format: quad royal. Dimensions: 40 x 50 inches, 1016 x 1270 mm. Poster, British Railways (North Eastern Region), Yorkshire, Kirkham Abbey, See England by Rail, by Freda Marston, about 1950. Coloured lithograph depicting the bridge over the River Derwent and the ruins of the Augustinian Kirkham Priory near York. Inscription at the bottom of the illustration reads "Kirkham Abbey, Freda Marston". Text below the illustration with the British Railways 'totem' logo in brown. Printed by John Waddington Limited. Text in bottom margin reads "Published by the Railway Executive (North Eastern Region)(A.R.1102) ....t Britain, John Waddington Ltd., Leeds &....". There are small tears at the bottom edge. Format: double royal. Dimensions: 40 x 25 inches, 1016 x 635mm. Poster, London Midland & Scottish Railway, Fleetwood - Lancashire's Great Fishing Port by Norman Wilkinson. Harbour scene ( same picture as 2001-8345) Text: Lancashire's Great Fishing Port by Norman Wilkinson. R.I. Fleetwood stands at the Mouth of the River Wyre and is the leading Fishing Port on the West Coast of Great Britain. It has also an extensive coastwise shipping trade. Fleetwood has a fine Promenade and Marine Gardens and is becoming increasingly popular as a holiday resort. There is a regular Steamer Service with the Isle of Man during the Summer Season. Format: double royal. Dimensions: 40 x 25 inches, 1016 x 635 mm. Poster, London & North Eastern Railway, Edinburgh - The Palace of Holyroodhouse with soldiers on foot and horseback in the foreground by Fred Taylor, printed by John Waddington Ltd., Leeds & London. Format: quad royal. Dimensions: 40 x 50 inches, 1016 x 1270 mm. Poster, London & North Eastern Railway, York Minster - England's Treasure House of Stained Glass by Fred Taylor, 1924, interior of minster showing stained glass, printed by John Waddington Ltd, Leeds & London. Format: quad royal. Dimensions: 40 x 50 inches, 1016 x 1270mm. Poster, London & North Eastern Railway, Edinburgh - The Palace of Holyroodhouse by Fred Taylor, printed by John Waddington Ltd., Leeds & London. Format: quad royal. Dimensions: 40 x 50 inches, 1016 x 1270 mm. Poster, London & North Eastern Railway, Lincoln by Fred Taylor, cathedral with buildings in foreground, printed by John Waddington Ltd, Leeds and London, backed on Linen. Format: quad royal. DImensions: 40 x 50 inches, 1016 x 1270mm. Poster, London & North Eastern Railway, Fountains Abbey by Fred Taylor, 1927, printed by John Waddington Ltd., Leeds & London. With large building on the left with the abbey in the background. Poster, London & North Eastern Railway, Lincoln by Fred Taylor, 1924. Coloured lithograph depicting Lincoln Cathedral with the docks of Brayford Pool in the foreground. Printed by John Waddington Ltd., Leeds & London. Format: quad royal. Dimensions: 40 x 50 inches, 1016 x 1270 mm. Poster, London & North Eastern Railway, Byland Abbey by Fred Taylor, 1934, printed by John Waddington Ltd., Leeds & London. shows the abbey ruins. Format: quad royal. Dimensions: 40 x 50 inches, 1016 x 1270mm. 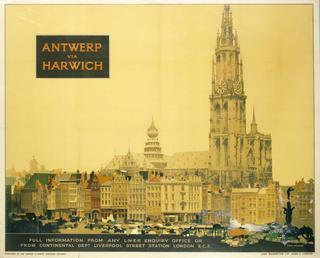 Poster, London & North Eastern Railway, York Minster. England's Treasure House of stained glass, interior of York Minster, by artist Fred Taylor, 1924, printed by John Waddington Ltd, Leeds and London. Format: quad royal. Dimensions: 40 x 50 inches, 1016 x 1270mm. 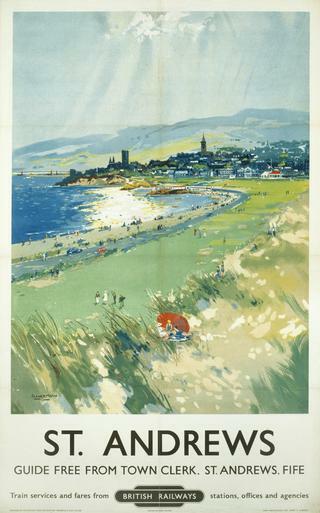 Poster, London & North Eastern Railway, The Yorkshire Coast by Andrew Johnson, 1932. Coloured lithograph depicting a seaside village, probably intended to represent Runswick Bay. Houses with red tiled roofs lead down to a beach, with a bay and cliffs in the background. Accompanying text notes that illustrated booklets are available from Liverpool Street, Edinburgh Waverley, York and Aberdeen stations. Printed by John Waddington Ltd., Leeds & London. Format: quad royal. Dimensions: 40 x 50 inches, 1016 x 1270mm. Poster, London & North Eastern Railway poster, Redcar by Austin Cooper, 1930. Coloured lithograph a well dressed group of young people on the beach, with the pier in the background. Accompanying text advises on how to obtain a guidebook. At bottom right is the LNER 'lozenge' totem. Printed by John Waddington Ltd., Leeds & London. Format: quad royal. Dimensions: 40 x 50 inches, 1016 x 1270mm. 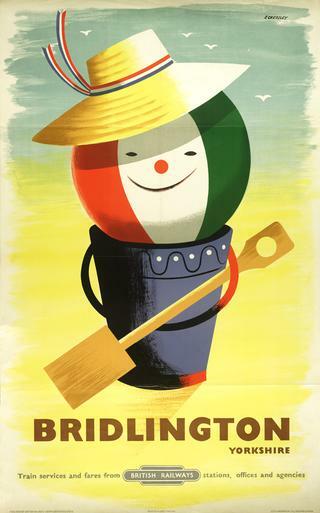 London & North Eastern Railway poster. 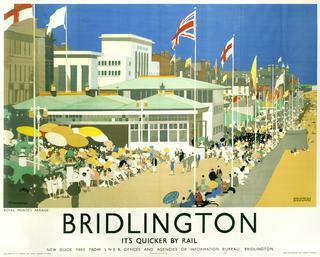 Bridlington - It's Quicker by Rail / by Kenneth Shoesmith, 1939. Printed by John Waddington Ltd., Leeds & London. Shows Royal Prince's Parade, the parade full of people leading down onto the beach. Format: quad royal. Dimensions: 40 x 50 inches, 1016 x 1270mm. Poster, London & North Eastern Railway, 'The Silver Forth', Scotland for Holidays, by Norman Wilkinson, about 1935. Coloured lithograph depicting a view, over trees, across the Firth of Forth to the Forth Bridge, with sunrays shining through clouds. At bottom right and left is the L.N.E.R. 'eye' logo. Printed by John Waddington Ltd., London & Leeds. Format: quad royal. Dimensions: 40 x 50 inches, 1016 x 1270 mm. Poster, London & North Eastern Railway, 'Dine well by LNER - 200 Restaurant cars', by Tom Purvis, Fashionable woman diner in restaurant car, Printed by John Waddington Ltd, Leeds and London. Format: quad royal. Poster, London & North Eastern Railway, 'Byland Abbey, York, Coxwold Station - It's Quicker by Rail' by Fred Taylor, 1934, view of abbey ruins, printed by John Waddington Ltd, Leeds & London. Format: quad royal. Dimensions: 40 x 50 inches, 1016 x 1270mm. Poster, London & North Eastern Railway, East Coast Resorts by LNER Excursions, by Tom Purvis, 1926. Coloured lithograph depicting a woman in a red bathing cap, red swimsuit and red and white shoes splashing in the sea. Accompanying text above and below the illustration, with an LNER 'lozenge' logo at right. Additional text reads "All information at stations and offices". Text in bottom margin reads "Published by the London & North Eastern Railway. Printed in England. John Waddington Ltd., Leeds & London". Format: quad royal. Poster, London & North Eastern Railway, The Yorkshire Coast, by Laura Knight, 1929. Coloured lithograph depicting four young women throwing balls on a sandy beach. Accompanying text below gives details of 'The Holiday Handbook'. Printed by John Waddington Ltd., Leeds & London. Format: quad royal. Dimensions: 40 x 50 inches, 1016 x 1270mm. Poster, London & North Eastern Railway, Rievaulx Abbey - recently excavated chapter house in foreground by Fred Taylor, 1933, view of ruins with visitor taking photograph, printed by John Waddington Ltd, Leeds & London. Backed on Linen. Format: quad royal. DImensions: 40 x 50 inches, 1016 x 1270mm. Poster, London & North Eastern Railway/London Midland & Scottish Railway, Western Highlands - Rob Roy by Doris Zinkeisen. With illustration of Rob Roy standing on a hill in the rain. Printed by John Waddington Ltd., Leeds & London. Format: quad royal. Dimensions: 40 x 50 inches, 1016 x 1270 mm. 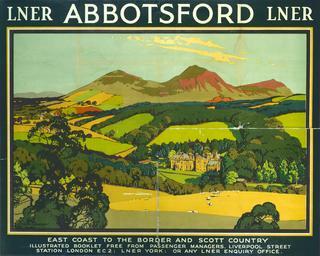 London and North Eastern Railway / London Midland and Scottish Railway poster. Published by LNER. Edinburgh. The Castle from Prince's Street. Shield with heraldic lion bottom centre. Text: It's quicker by rail. Full particulars from LNER or LMS Offices and Agencies. Format: quad royal. Dimensions: 40 x 50 inches, 1016 x 1270 mm. Poster, London & North Eastern Railway, Edinburgh - North British Hotel, Waverly Station, by Fred Taylor, view of Hotel with Calton Hill in background, printed by John Waddington Ltd, Leeds & London, backed on Linen. Format: quad royal. DImensions: 40 x 50 inches, 1016 x 1270mm. 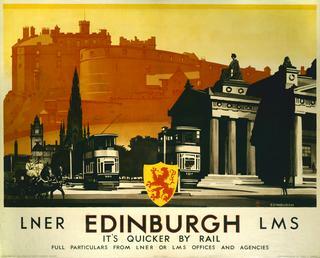 Poster, London & North Eastern Railway, Ely by Fred Taylor, 1932, printed by John Waddington Ltd., Leeds & London. With view of the a Format: quad royal. Dimensions: 40 x 50 inches, 1016 x 1270mm. Poster, British Railways (North Eastern Region), Northumberland - The Roman Wall, by Jack Merriott, depicting walls, hills and sheep, printed by John Waddington Ltd, Leeds and London. Format: double royal. Dimensions: 40 x 25 inches, 1016 x 635mm.